The seventeenth and eighteenth centuries are arguably the most important period in philosophy’s history, given that they set a new and broad foundation for subsequent philosophical thought. Over the last decade, however, discontent among instructors has grown with coursebooks’ unwavering focus on the era’s seven most well-known philosophers—all of them white and male—and on their exclusively metaphysical and epistemological concerns. While few dispute the centrality of these figures and the questions they raised, the modern era also included essential contributions from women—like Margaret Cavendish, Elisabeth of Bohemia, Mary Wollstonecraft, and Émilie Du Châtelet—as well as important non-white thinkers, such as Anton Wilhelm Amo, Julien Raimond, and Ottobah Cugoano. At the same time, there has been increasing recognition that moral and political philosophy, philosophy of the natural world, and philosophy of race—also vibrant areas of the seventeenth and eighteenth centuries—need to be better integrated with the standard coverage of metaphysics and epistemology. 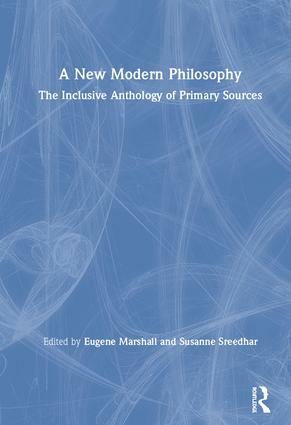 A New Modern Philosophy: The Inclusive Anthology of Primary Sources addresses—in one volume—these valid criticisms. Weaving together multiple voices and all of the era’s vibrant areas of debate, this volume sets a new agenda for studying modern philosophy. It includes a wide range of readings from 34 thinkers, integrating essential works from all of the canonical writers along with the previously neglected philosophers. Arranged chronologically, editors Eugene Marshall and Susanne Sreedhar provide an introduction for each author that sets the thinker in his or her time period as well as in the longer debates to which the thinker contributed. Study questions and suggestions for further reading conclude each chapter. At the end of the volume, in addition to a comprehensive subject index, the book includes 13 Syllabus Modules, which will help instructors use the book to easily set up different topically structured courses, such as "The Citizen and the State," "Mind and Matter," "Education," "Theories of Perception," or "Metaphysics of Causation." And an eresource offers a wide range of supplemental online resources, including essay assignments, exams, quizzes, student handouts, reading questions, and scholarly articles on teaching the history of philosophy. "This rich anthology of primary readings, with its inclusion of texts by women philosophers and philosophers of color, as well as topics rarely studied in survey courses of seventeenth- and eighteenth-century philosophy, is a superb and highly welcome new resource for teaching early modern thought." "This new anthology by Sreedhar and Marshall reflects the most recent scholarly advancements by including an impressively diverse range of figures who tackled a myriad of fascinating and important philosophical topics in the early modern period. Students who read it, and instructors who teach it, will obtain a far more accurate picture of early modern philosophy than those using standard textbooks." Eugene Marshall is Associate Professor of Philosophy at Florida International University. He is the author of The Spiritual Automaton: Spinoza's Science of the Mind (2014) and editor of Margaret Cavendish’s Observations Upon Experimental Philosophy (2016). Susanne Sreedhar is Associate Professor of Philosophy and Women’s, Gender, and Sexuality Studies at Boston University. She is the author of Hobbes on Resistance: Defying the Leviathan (2010) and a number of articles and book chapters. Her current research is on notions of gender in early modern social contract theory.